99 milion year old tick clinging on to Dinosaur feather found preserved in amber! 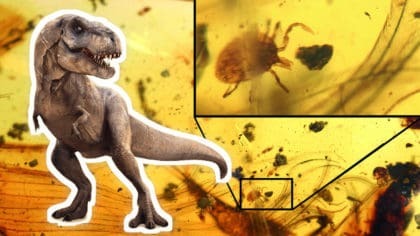 Scientists have discovered tick buried in amber that might contain dinosaur blood! Ticks are tiny parasites that bite their victims and spread diseases, and amber is fossilised tree resin. Basically, a tick was probably clinging on to a tree when the sap caught it and preserved it forever. It can be found holding on to a dinosaur feather and is estimated to be over 99 million years old. Immortalised in the golden gemstone, the bloodsucker’s last supper is remarkable because it is rare to find parasites with their hosts in the fossil record. David Grimaldi, an entomologist at the American Museum of Natural History was one of the people who made the discovery. He and his colleagues concluded that the tick was similar in size to a deer tick nymph and that its host was most likely no bigger than a hummingbird. The parasites were most likely living in the dinosaurs’ nests.